Mercedes-Benz India finally launched the highly awaited A-Class in Mumbai today at a starting price of Rs. 21.93 lakh (ex-showroom, Mumbai). The A-class has been made available in two different trims; A 180 CDI Style will be available at an introductory price of Rs. 21.93 lakh (ex-showroom, Mumbai) and the A 180 Sport will be available at an introductory price of Rs. 22.73 lakh ( ex-showroom Mumbai). 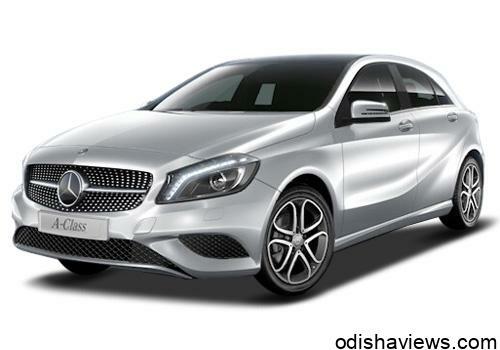 Which means the A-Class is the most affordable Mercedes ever, and with its affordable tag the car sets new standards with its eye-catching trendy, cool and youthful design idiom, heralding the new era of compact luxury cars in India. With the best of design elements, comfort, sportiness, safety and efficiency, the stylish new A-Class was launched by Mr. Eberhard Kern, Managing Director and CEO, Mercedes-Benz India. The A-Class introduces a new chapter in the compact luxury segment: markedly emotive in design, with an efficient 1.6 litre, 4 cylinder petrol engine and 2.2 litre, 4 cylinder diesel engine with streamlined aerodynamic design ensuring minimalistic drag coefficient of 0.27. The new A-Class underlines that safety for Mercedes-Benz safety is always the top priority, with 7 Airbags. The A-Class features ESP (Electronic Stability Program), helping to minimize the loss of control of the car during emergency braking. ASR (Acceleration Skid Control), electric parking brake, ABS (Antilock Braking System), Brake Assist System, Attention Assist and Hill Start Assist in cohesion makes the A-Class one of the safest cars on Indian roads. The A-Class offers the fresh definition of dynamism raising the benchmark significantly through efficient driving dynamics for the Indian road conditions. The A-Class features the ECO start/stop function as standard which makes the A-Class particularly economical. The engines are mated with the 7G-DCT 7 speed dual-clutch automatic transmission. The constant interplay between concave and convex planes creates a characteristic play of light, particularly along the sides of the car, which contributes to its unique appearance. The feature lines, particularly along the sides of the car, give the A-Class structure and tautness. The wide front bumper lends an assertive look to the car. The sporty front in its pronounced V-shape and the radiator grille glimmering with 302 diamond resembling pins with a central Mercedes star is one of the key aspects of the new design language. The Bi-Xenon lamps with the assortment of light modules and LEDs behind the headlamp cover glass have been arranged in such a way as to create the characteristic “flare effect” for the daytime running lamps and indicators. This signature effect gives the car its energetic look and so helps to define a new, youthful face for Mercedes. The perfect interplay of dynamic design and excellent aerodynamics is nowhere more apparent than in the roof. The front structural edge, above the wing, falls in a “dropping line” in a gentle arc towards the rear. The powerfully shaped shoulder muscles above the rear fender serve to emphasize the car’s coupé-like character. All these lines give depth and dynamism to the car’s profile. The A 180 CDI will have the Style Package that includes Sport seats, matrix look trim and twin 5 spoke 17” alloys. The A-Class boasts of the best in class sporty interiors. The F1 inspired sporty seats and the emotive dashboard design gives a splendid feeling of driving a sports car. Features like the ergonomic cockpit and ample visual highlights underline exceptional interior quality of the car. Apart from the visual aspects the car also has 341 liters of boot capacity which is the best in the class. The premium ARTICO upholstery along with the SLS AMG inspired cockpit interiors perfectly matches the taste of young and vibrant target customers. The A-Class also consists of trailblazing infotainment system which is equipped with ergonomically placed central controller (14.7 cm colour display, iPhone compatible USB, AUX-in, Bluetooth, audio streaming, MP3/WMA/AAC, CD cover display). The new A-Class has already received a number of awards for its progressive design. The A-Class won The Red Dot Design Award 2013, which is one of the world’s most renowned awards, for its unique design and product concept. It was also named “Germany’s Most Beautiful Car” at the 2012 AUTO BILD Design Award. The readers of the German ADAC Motorwelt and users of the ADAC internet site also showed their support for the A-Class: Germany’s favorite car was awarded the Yellow Angel 2013 by Europe’s largest automobile club. As part of Total Cost of Ownership for the NGC (New Generation Cars) segment, the A-Class also comes with unique service products like Star Ease and Star Care which are industry benchmark in the luxury segment. There is Special Pricing for the A-Class spare parts which on an average are lower than other segments of Mercedes-Benz India. The simplicity of shared architecture will result into optimized cost of labor which is also passed onto the customers thereby further enhancing total cost of ownership. The extended warranty of the A-Class for the 4th year is available and will be offered along with the car’s launch, and this is priced at less than 1 % of the Vehicle price. Mercedes-Benz India also launched a major digital media offensive campaign which created a lot of buzz around the launch of the A-Class. This campaign addressed all the major social media platforms like You Tube, Twitter, Instagram, Facebook and Pinterest. A-Class was trending on twitter much ahead of its launch and has become a favorite conversation topic for netizens who eagerly anticipates the launch of the car in India.